One banana, two banana, three banana, four….. I think we have at least one too many bananas! At our house, we tend to go through a lot of bananas in a week. We use them by themselves, in shakes, cookies, muffins and breads and we even freeze them for future use. Even still, there’s a limit to just how many bananas one family can eat. Last week we were out of bananas, so when my husband was in the grocery store, he bought two bunches. The next day as I was in a different grocery store, picking up the remainder of what we needed, I also grabbed a bunch of bananas because I hadn’t yet seen the ones he bought. I hung my bunch up on the hook in the kitchen, only to have him bring his two bunches up later that day. Suddenly, we had *a lot* of bananas. We’re already down one bunch since that day, but we have two bunches to go, so I’ve been gathering up some of my most banana-y recipes and putting them on the top of my list. This week, I had one of my favorite lunches, but it’s one I can’t have every day because it’s not really stellar in the way of being very healthy. It’s got a banana in it though, so that’s good, and peanut butter, so that’s good too. If you decide to wash it down with a glass of milk, that’s a bonus. I read about this sandwich online somewhere, and whenever I eat it, I imagine it’s the type of sandwich that would be featured on a show like “Diners, Drive-ins and Dives,” where you see amazing things made into a sandwich or piled on top of a waffle, or some other sort of unusual meal. Ooey and goey, this sandwich is a twist on the old school lunchbox version. The Grilled Peanut Butter and Banana Sandwich is a twist on an old favorite lunchbox staple, the peanut butter and banana sandwich. The recipe I saw online actually had cream cheese and honey in it also, but that didn’t appeal to me as much. I have done this sandwich in three different varieties so far: peanut butter and banana, with peanut butter, honey and banana, and with peanut butter, Nutella and banana. I’ve eaten it for breakfast some days or for lunch other days. The added touch of the grilled bread makes the sandwich warm and gooey. I’m sure there are other varieties you could try, including the one with cream cheese and honey if you so desire. Enjoy today’s banana recipe, and feel free to share with me some of your favorite banana recipes in the comments below! 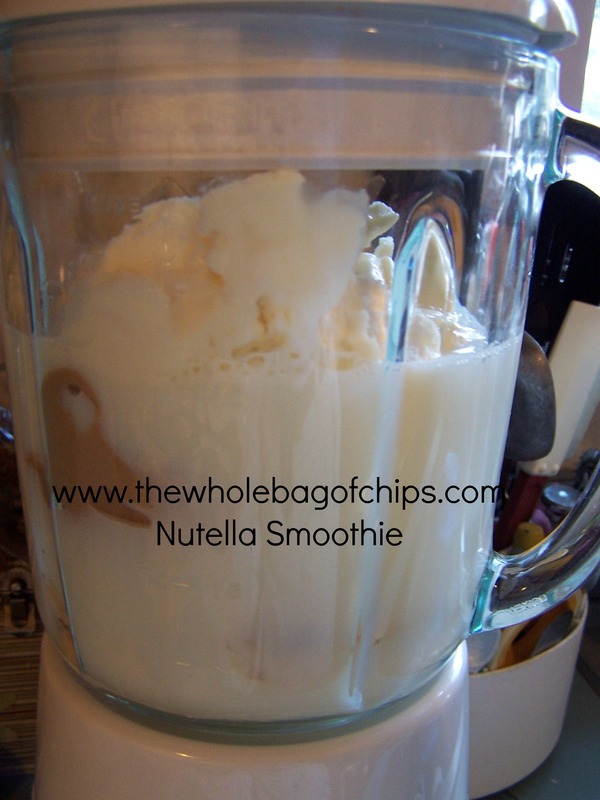 The most-requested after school snack! This week seems to have flown by. The weather is nice and work, school and activities are keeping us busy. Summer will be here before we know it, with school getting out in about four weeks’ time. Not that I’m counting down or anything. Today I wanted to share a quick and easy snack, that has quickly become a frequent request. I started making it after seeing some video floating around on social media where someone was spreading Nutella on some sort of dough, rolling it and baking it for a delicious looking dessert. I never actually got to watch the whole video, but I kept seeing it pass by and it stuck with me. 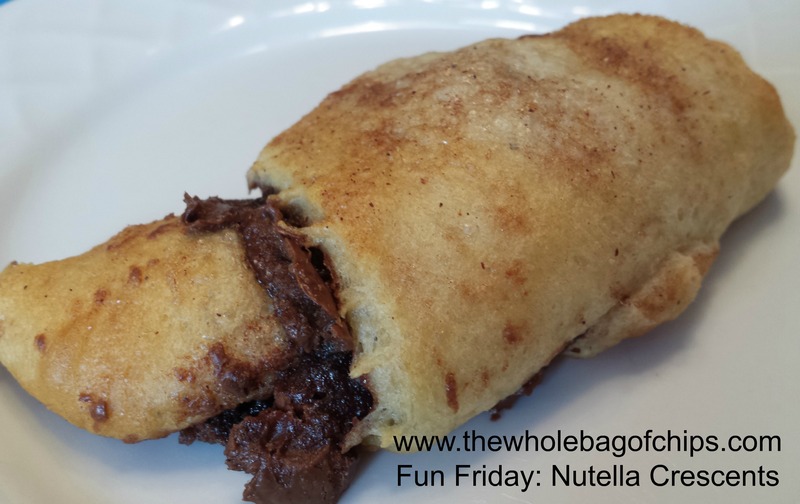 One day I remembered to grab some lowfat crescent roll tubes at the store and I always have Nutella on hand, so when I had a chance, I decided to see what I could come up with for a different after school snack. I spread the crescents out, spread Nutella on the inside, and sprinkled some cinnamon and sugar inside. I rolled the crescents as usual, and I sprinkled cinnamon and sugar on top, adding a dab of butter (we use I Can’t Believe It’s Not Butter) on top. I baked them until they were golden brown and served them. A huge hit. I can’t even emphasize enough how much they all love these little snacks. 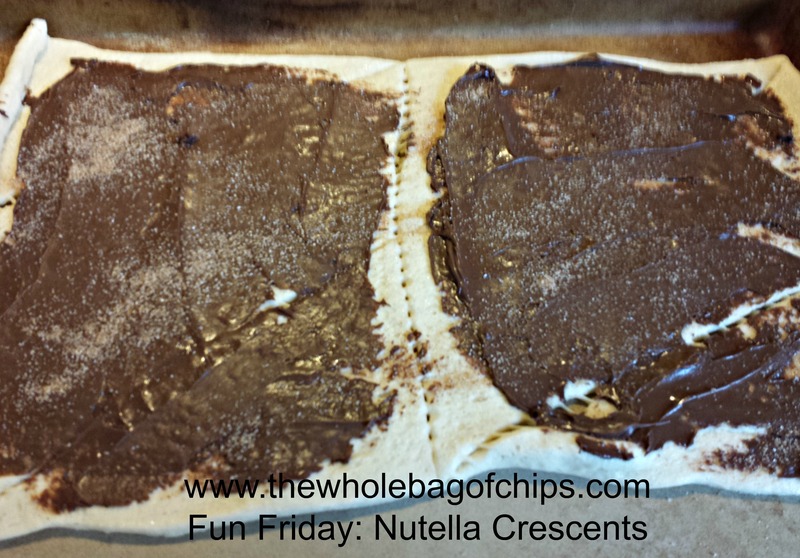 I’ve filled them the same way with just butter, cinnamon and sugar when I didn’t have enough Nutella for two cans of crescents, and they were a hit as well. I mean really, what’s not to love? These are such a simple snack. They can be made by the kids too. Anything that can be made by the kids is a plus in my book. I’ve made these more times than I can count. I now buy the crescents on a regular basis and I’ve made them when the kids have had friends over, as well as for just us. I’m even planning to make them for an event this weekend. If you’re looking for something quick and easy, and of course, delicious, give them a try! 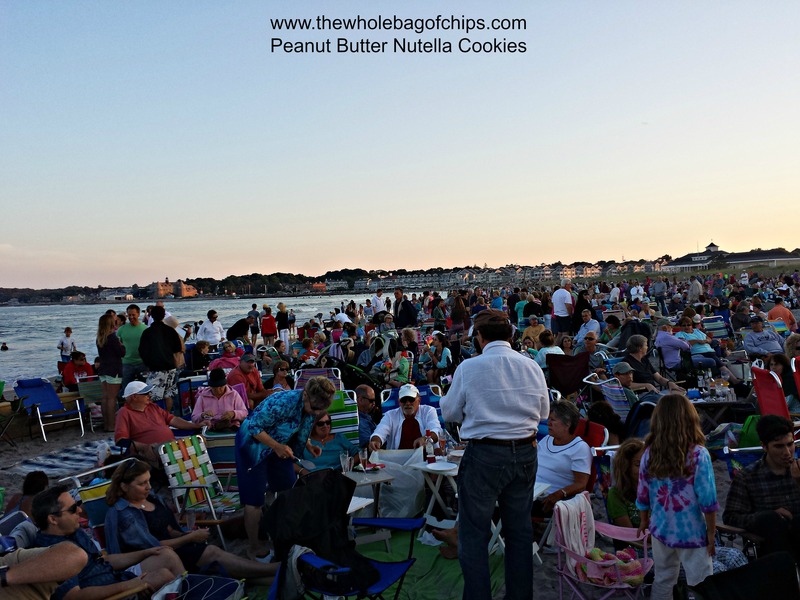 Erica’s cookies were a perfect addition to our Concert on the Beach dessert menu! Each summer there are several traditions that we look forward to, and the summer isn’t complete unless we’ve participated in these traditions. One such tradition is the annual Concert on the Beach: an ocean-side philharmonic orchestra concert. Part of the lure of this event, other than the stunning scenery and amazing musical performance, is the fact that it’s been taking place for almost 40 years and of those almost 40 years I’ve been to almost all of them, and my children have never missed one in their lives yet. When we lived out of state, we traveled home for this concert, it means that much to us. Another lure of this event is the fact that we attend the concert (which is free) with a lot of our family and friends. It’s hugely attended by thousands of people and you bump into people all night long. “Everyone” goes to the Concert on the Beach. Each summer as the date of the concert gets closer, we begin to plan our menu. Everyone brings a little something until we have compiled a huge potluck dinner spread which we’ll eat on the beach. As the sun sets and the moon appears, we transition from dinner to dessert, and each year I am “on” for bringing a dessert, as it’s my favorite part of the meal. Each year I try to think of something special, something unique, and something new to try out as my dessert contribution for the concert. 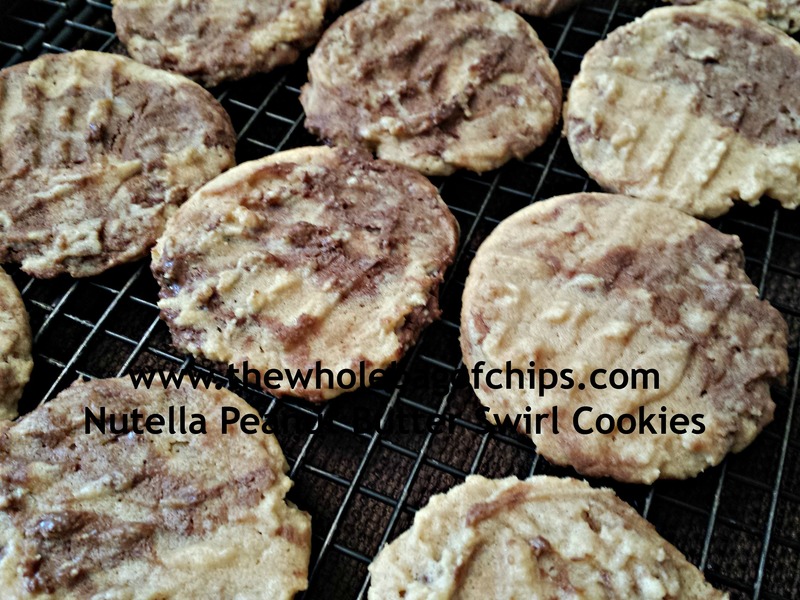 This year I had come across a recipe from the blog, “Erica’s Sweet Tooth,” a recipe for Peanut Butter Nutella Swirl Cookies. Really, Peanut Butter and Nutella in a cookie?? What’s not to love? I decided to give these cookies a try for the concert. And, having faith in a good ingredient combination, I doubled the recipe. I’m so glad I did! These cookies were awesome!! I am putting Erica’s recipe below, just as she has it on her blog. You can see my cookies pictured above. They look amazing right?? I did substitute I Can’t Believe It’s Not Butter for the unsalted butter, but otherwise my ingredients were the same as she has them here. 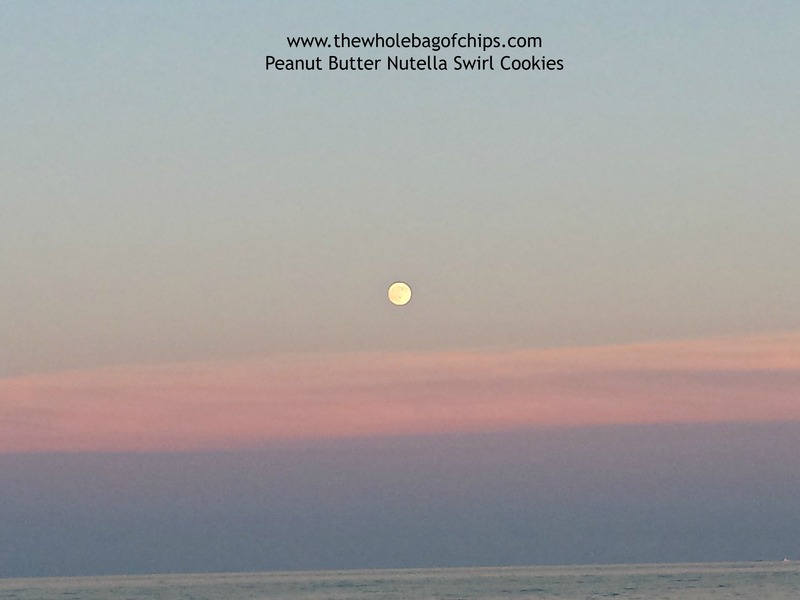 Our view of the sunset and Super Moon from our seats in the sand as we watched the Concert on the Beach this year. In the bowl of an electric mixer, beat together butter, peanut butter, and sugars until light and fluffy, about 2-3 minutes. In a separate bowl, whisk together flour, baking soda, and salt. With mixer on low, slowly incorporate the dry ingredients into the butter mixture until just combined. Chill the dough in the fridge for 15 minutes and then roll small balls by hand. Place about an inch apart on a parchment paper-lined cookie sheet and use a fork to press down the balls slightly. The view of the audience behind us. People listening and enjoying as far as the eye can see, in all directions. We’ve made these muffins at least three times since we first saw the recipe online! You know how much I love muffins. I’m always on the hunt for a new muffin recipe to try out. My family likes them too. Add that to the fact that I love Nutella, and they do too, and that makes this muffin recipe from The Novice Chef absolutely perfect. A friend of mine posted it online and tagged me in the post; a list of tons of Nutella recipes all in one spot. This recipe was just the first one, just the tip of the Nutella iceberg. My usual routine on most Saturday nights is to make a batch of muffins for us to grab and go on Sunday mornings before church. It seems to work well and these muffins were a great addition to my ever-growing list of muffin recipes for our Sunday mornings. These muffins were also easy enough to make that one afternoon Caroline made them herself. That’s always a good sign: when someone can make the muffins for me! So if you’re a muffin lover yourself, and a lover of Nutella, I highly recommend that you give these a try! 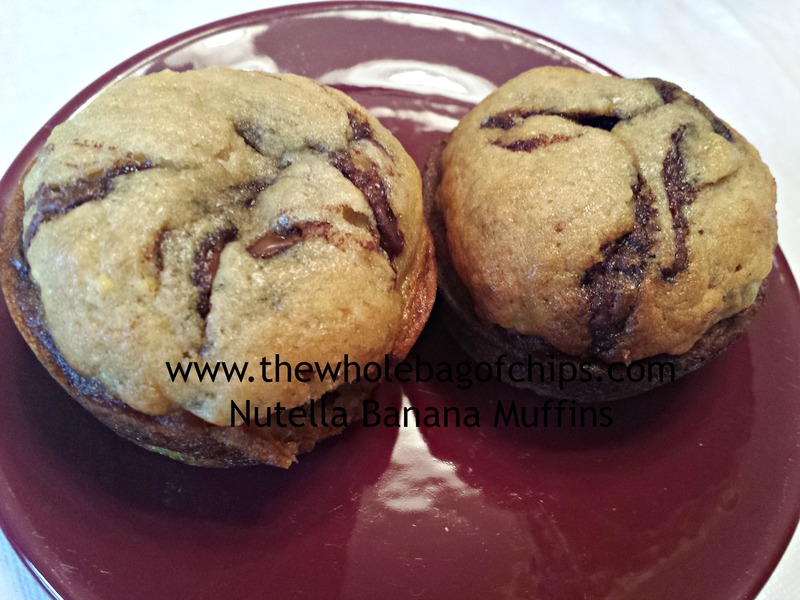 In my opinion, the addition of bananas to the recipe makes it even better…healthier!! It calls for four, and I’ve used as few as three. I also found that using a steak knife for the swirling instead of a toothpick is easier. The batter and the Nutella are thick and a knife holds up better for a great swirl. And finally, this recipe makes 18 muffins. For a family of 5, that’s excellent. Muffin recipes that yield a dozen are good, but those that yield 18 are better!! Imagine waking up to these on your Sunday morning? Preheat oven to 350°F. Line muffin pan with liners. Fill muffin tins 3/4 full. 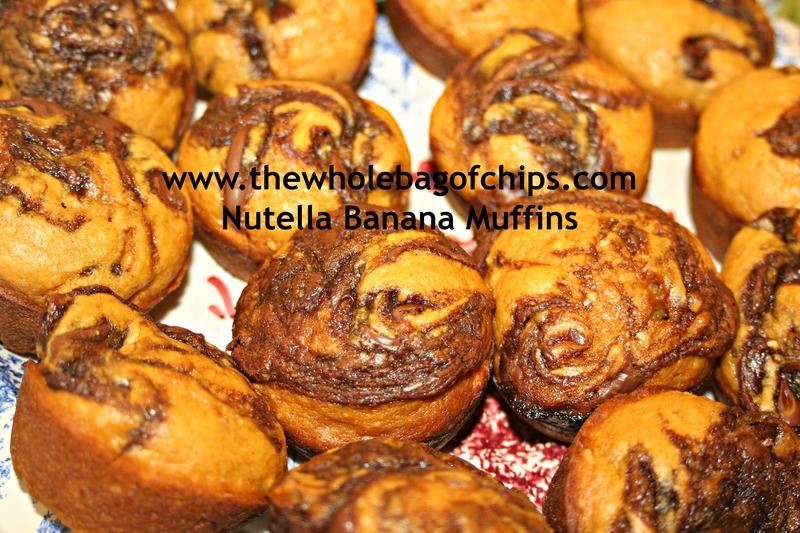 Top each muffin with about 1 teaspoon of Nutella and use a toothpick to swirl it into the batter. This is a great treat for (me) the kids after school! 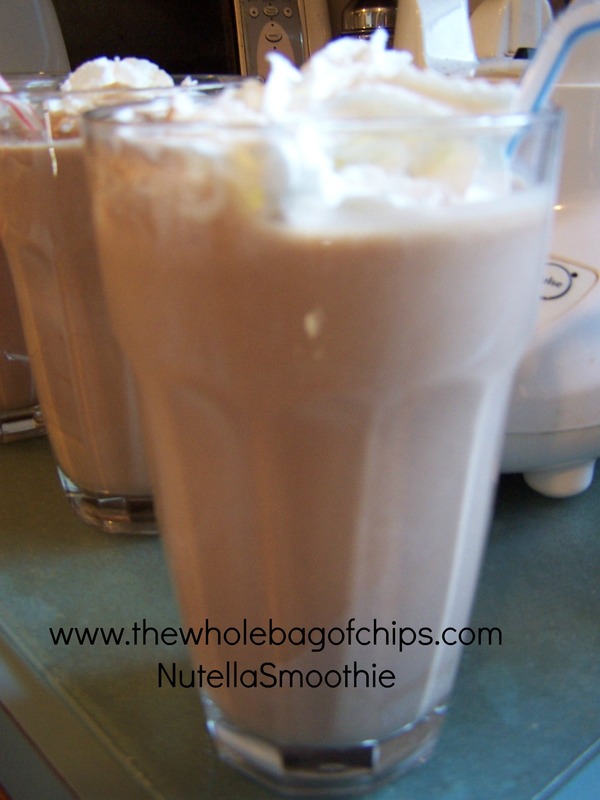 Recently a friend passed along a recipe for a Nutella Frosty which sounded delicious. It called for milk and vanilla ice cream and Nutella. We decided to make it even MORE wonderful! It was such a hit, we had it several times this summer and we already had it for an after school snack once this school year, and we’ve only had six days of school! We added a few ingredients to the original frosty recipe, making it a little bit healthier. Into the blender it goes! Blend it all up, add some light whipped cream to the top, throw in a straw and you’re good to go! Nutella is not new, but there’s this great little treat that I make with it, which I’m addicted to! 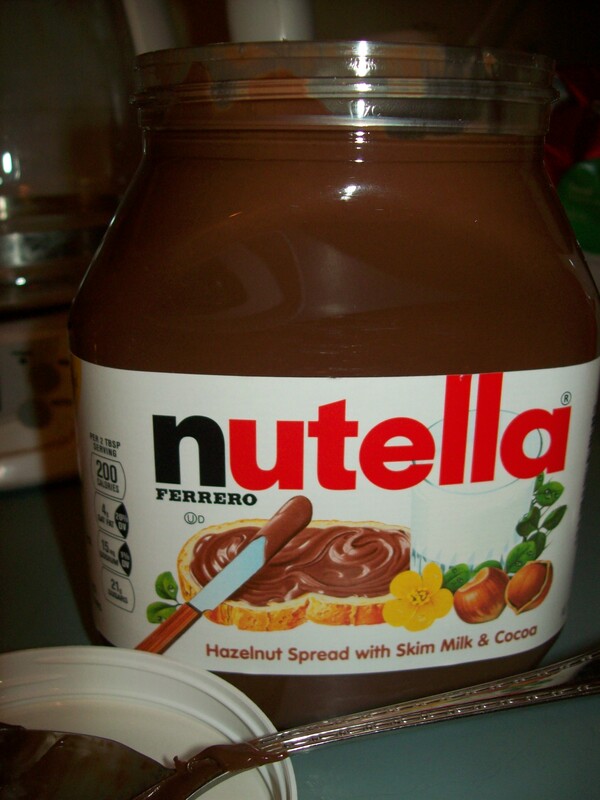 For the longest time, I knew that Nutella existed, but I never bought it. Yes, seriously. It was not on my all-the-time shopping list. That was in my old life. My pre-Nutella addicted life. Recently, Elizabeth came home and said how her good friend had a Nutella sandwich for lunch at school. It got me thinking. There’s so many things you can make with Nutella, and it might be a great treat for the kids’ lunches and mine, on occasion. Let me just say, it’s a slippery slope, that Nutella. One lunchtime treat has led to many jars of Nutella in my shopping cart. I love it for breakfast, for lunch, with strawberries, with bananas, with peanut butter and for a late night snack. And I keep finding bigger jars of it. I first started out with a small jar. I’d buy two at a time. Then I found an even BIGGER jar at Target. I’m on my second one of those. But I hear there’s an EVEN BIGGER jar available at BJ’s. I’m afraid to go see. I’d join just to buy it. 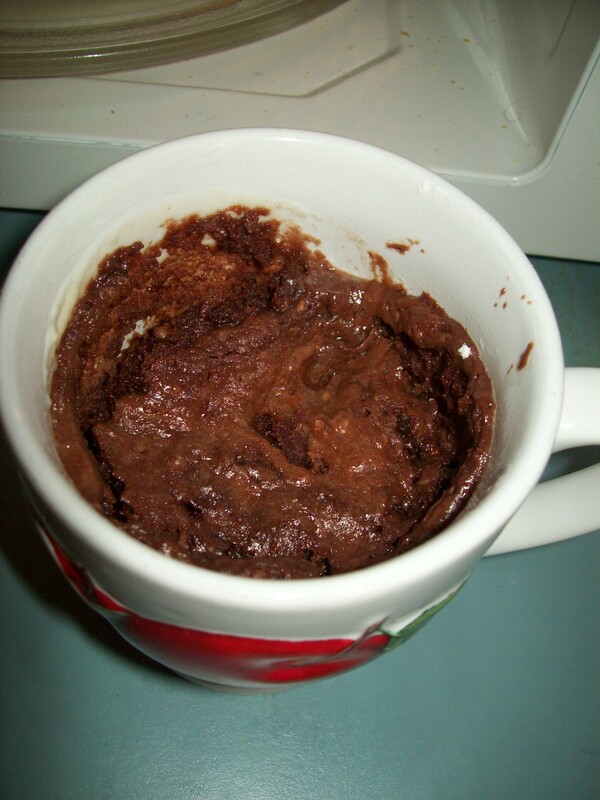 So one day, my friend Paula sends me a link she’d found to a Four Ingredient Nutella Mug Cake. She found it on a blog called Kirbie’s Cravings. Four ingredients. One of them being Nutella. I had all four ingredients. I’ve made a mug cake before from a different recipe for a coffeecake, and didn’t love it. Never posted it. I think I’ve made it four times in two weeks or so. It takes all of five minutes to mix up, if that. It takes all of one minute and 30 seconds to cook in my microwave. So today, for my Friday post I share with you my newest addiction: the Four Ingredient Nutella Mug Cake from Kirbie’s Cravings. Now pay attention when you read her blog post about this cake. She has taken a lot of ingredients out of her original recipe, which used to be over 1000 calories. Now it’s just over 500 calories. That’s still a lot. But knowing it *used* to be more, doesn’t that make it sound like a bargain? And she recommends sharing it. I don’t choose to go that route. She also recommends waiting to eat it until it cools. I don’t do that either. I can barely get it out of the microwave and I’m getting my spoon. I recommend topping it with whipped cream or something like that. My whipped cream is fat free. In fact, most of what we eat is low fat or fat free, so I don’t really feel terrible eating this on occasion. Here’s the recipe. Try it out! Combine all ingredients into an oversized mug. Mix with a small whisk until batter is smooth. Cook in microwave for about 1 minute. Sharp knife inserted should come out clean and top of cake should look done rather than gooey. If cake is not cooked in one minute, add an additional 20 seconds. Let cake cool in mug completely before eating.